I wanted this video to be as real as possible. 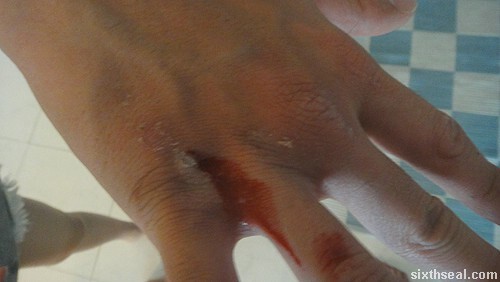 I really punched the wall and that caused the various scabs from my Krabi trip to open up and stain the walls with blood. You’ll notice (if you have eyes like a hawk) that I was wearing a Band Aid during some of the scenes. However, due to time and budget constraints we couldn’t do this. Actually the only reason we didn’t do this was due to logistical issues. We didn’t have a breakable bottle prop but it’s easy to use some blunt object to the same effect. However, it is highly unlikely that any bar would let us use their premises to do even simulated violence so we scrapped this. Sigh. I REALLY WANTED TO DO THIS. I searched high and low for heptane – the only safe way to do this. Of course my definition of “safe” means there is a better than 10% likelihood of not getting third degree burns and a 50% chance of actually pulling it off. I read that heptane is used in anti-bacterial washes so I went to a lot of pharmacies until a kind pharmacist told me that it’s not used in Malaysia. I called up several chemical suppliers but none of them will sell it to me. Heptane produces a warm flame just like gasoline (it’s also added to the petrol you pump at the gas station) instead of a sissy blue flame. The trick is NOT to douse yourself in it (that would send you to the hospital or the morgue) but to saturate a piece of mop (or something like that) with it and have someone run it over your body. It will feel warm but it won’t burn you per se. It’s the vapors that burn in this scenario, not the liquid. However, you have to remove all your hair though so I shaved my pits and wanted to shave my head but alas, no heptane. 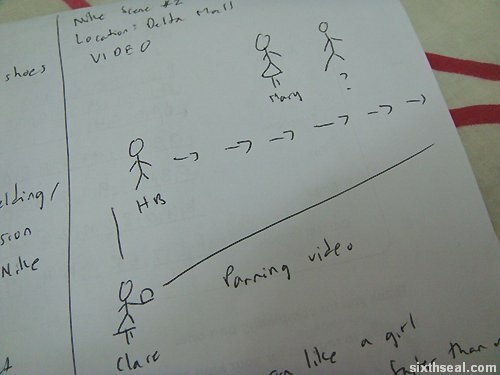 This video was actually shot over two weekends – the first weekend was spent doing the storyboard and we actually completed filming in 5 hours. We had another 2 ½ hour shoot the next weekend where we roped in strangers to help us and it turned out pretty good. 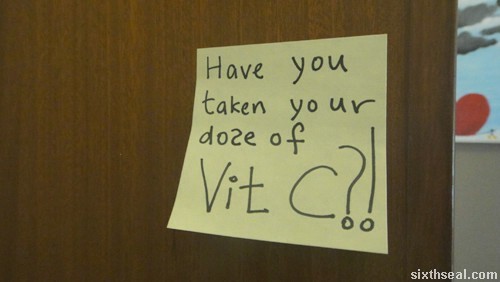 This is one of Cindy’s quirky notes around her house. I haven’t had my Vitamin C but I did get a good dose of Vitamin B from the Guinness that I drank. Check out my original post. Here’s the video again just in case you missed it. 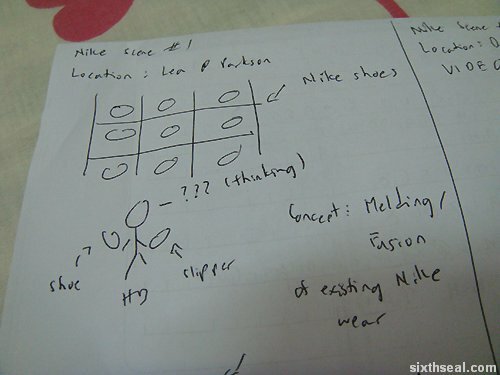 I received the Nike advertorial pretty late in the game (pun intended) and scripted out two major scenes that I wanted to be in the writeup. 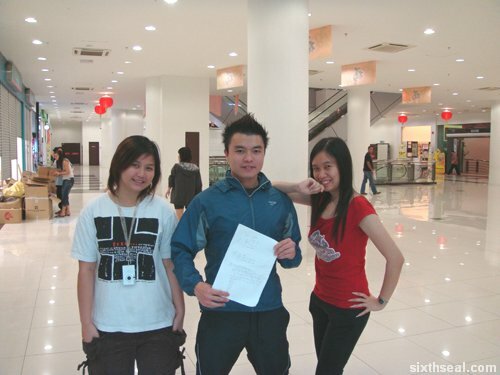 The first was to be shot at an athletic wear/sports gear shop/active lifestyle outlet (I don’t even know what these places are called nowadays anymore ;)) to do the visualization (Read: camwhoring) aspects of the design contest. 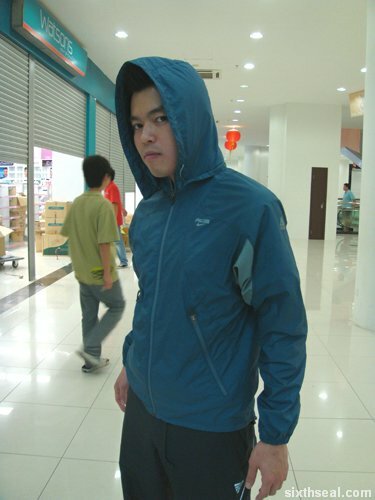 Thus, I geared up in my Nike ACG (All Climate Gear) windbreaker that I got in KK back in 2004 before climbing up Mt. Kinabalu (the highest mountain in South East Asia) for a bit of product placement pimpage and went out with Clare to do the photo shoot after work. 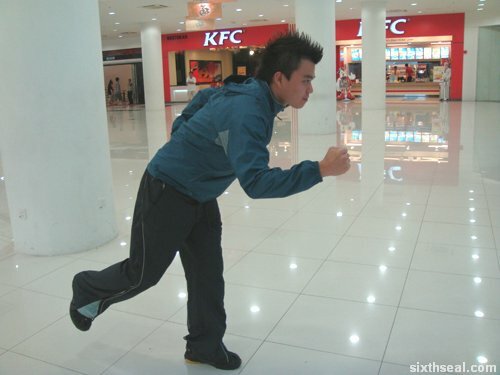 It should be noted that my tracksuit trousers were actually adidas and so were my trainers. It doesn’t look very obvious though so I thought it would pass The All Seeing Eye of Nike. 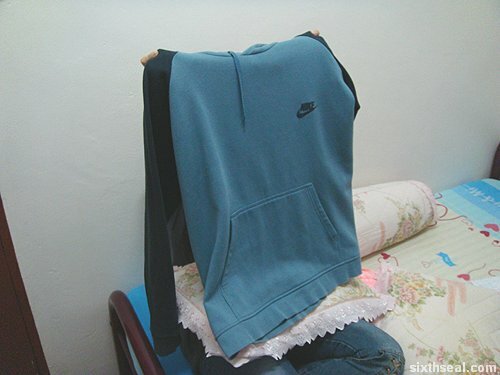 ;) I do have Nike apparel in my current wardrobe – I remember getting a limited edition Nike tennis shoe during the Melbourne Open 2003 and have several other pairs of Nike trainers. There’s also a Nike sweatshirt with a hoodie that I got for chilly spring weather in Melbourne which has found a new role as a tattoo concealer for Casual Saturdays in the office. The dress code in my office does not allow for visible tattoos so I wear long sleeves every single workday – even on Saturdays. Yes, we do work half day on Saturday over here in Sarawak. 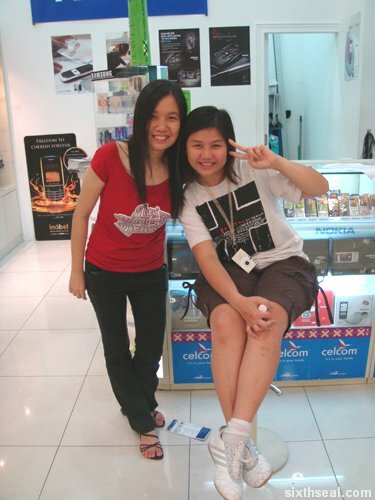 I proceeded to Delta Mall to meet up with Mary who was going to do the second major scene for the advertorial. I got a a lot of stares from people due to my athletic gear – I looked like I just finished a particularly grueling training session, but I kinda liked the attention. Heh! You’ve got to be able to take the double takes and stares if you’re a blogger going all out. 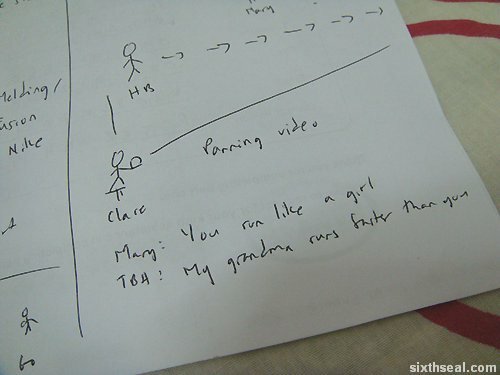 The duo had great localization which was not in the script with Mary going “You run like a girl lah” and the guy going “Hey, my grandmother runs faster than you, okay?” which I really liked. However, the best scene in the advertorial is, IMHO, one that I did not anticipate or script out. I was having my nicotine fix after finishing the photo shoot when I saw a security guard outside the mall doing the same. I remember the shoplifting scene for the Oreo advertorial and decided it would be fun to include the same theme into this one. 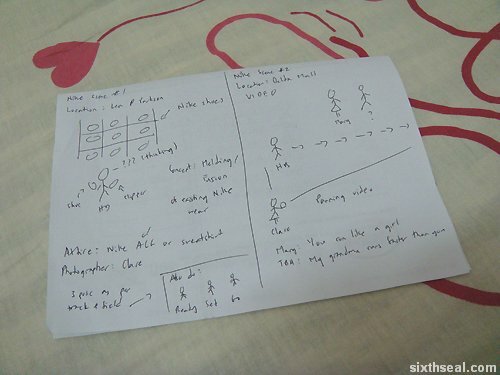 The exclusion was a really good decision in hindsight coz it seems so cheesy now. Heh! The girls convinced me to do a Jay Chou pose. I’m not even sure why I did that, since I don’t even listen to his music! This was one of the fastest advertorials that I’ve ever done with all the shoots completed in a day from script to editing. It was fun to go with the flow and see what scenes came out that wasn’t planned out. Cheers to Mary and Clare for helping out on this one! 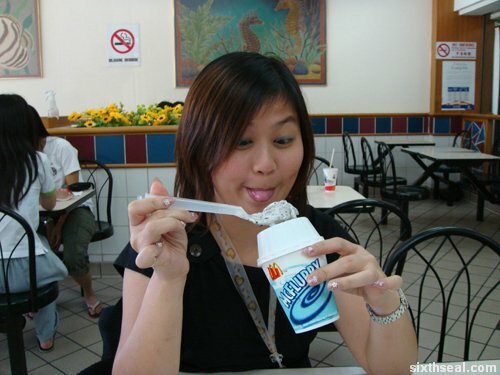 The Oreo Twist Lick Dunk advertorial was one of the ones I really enjoyed doing. 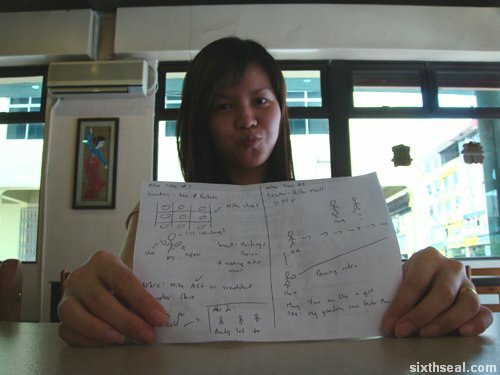 I enlisted the help of a couple of my friends and coworkers to participate in the script that I had written. 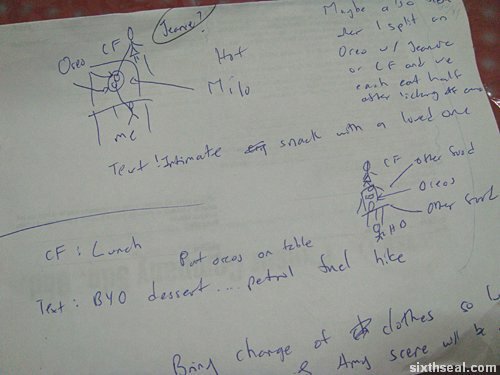 It was more of a doodle of sorts with stick figures of scenes I had envisioned and a rough idea of the text. 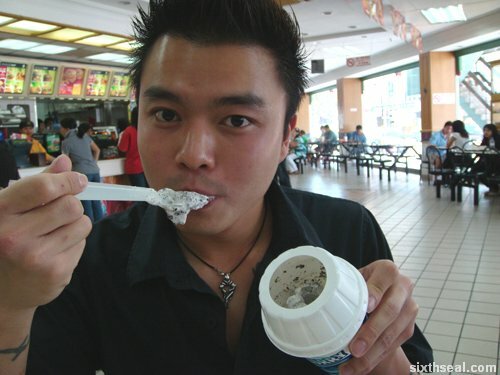 The first problem came even before the photo shoot – there were no Oreo cookies to be found in the entire Sibu town. 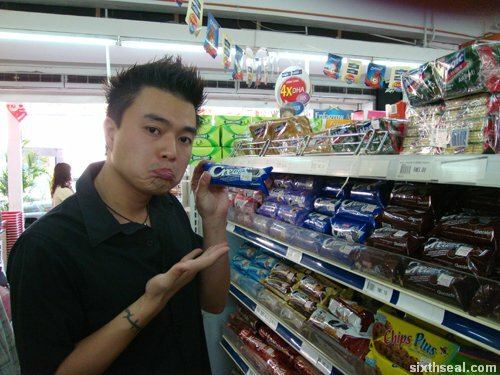 I searched every single supermarket and shopping mall and it seemed like there was a town-wide shortage of Oreo! I finally managed to find out the reason behind it – the manufacturer had recalled all the existing Oreo cookies and issued a memo to the retailers with instructions to take it off the shelves pending the arrival of the new packaging. The ship was supposed to have arrived but it got delayed at some port and no one had any idea of when it’ll actually come. I thought about changing the script to a “Pepsi Test” writeup with people being blindfolded and asked to determine which cookie tastes better – Oreo or a local emulated version e.g. Cream-O but that would require Oreo biscuits as well. I was a bit concerned about the uncertainty surrounding the arrival of the shipment of Oreo to the Sibu market so I decided to take matters into my own hands. In the meantime, I enlisted the help of Mary in my alternate scripts. 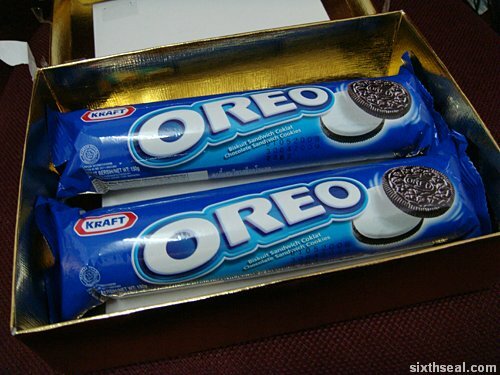 I remember one of the alternate scripts was about not being able to find Oreo and wanted to title that post as “sixthseal.com and The Quest for the Holy Oreo“. The script went along the lines of being unable to get my hands on genuine Oreo cookies in Sibu and having to resort to having it sent from KL. 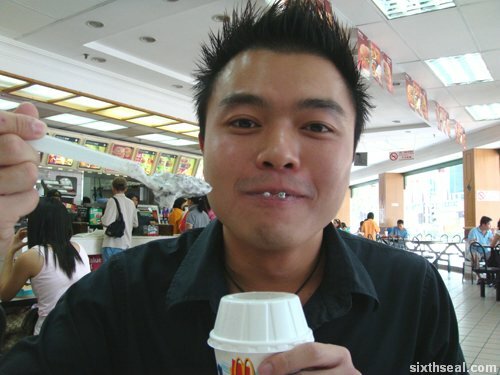 I even went to McDonald’s just to get a shot of their Oreo McFlurry, which was just about the only Oreo containing product in Sibu at that time. 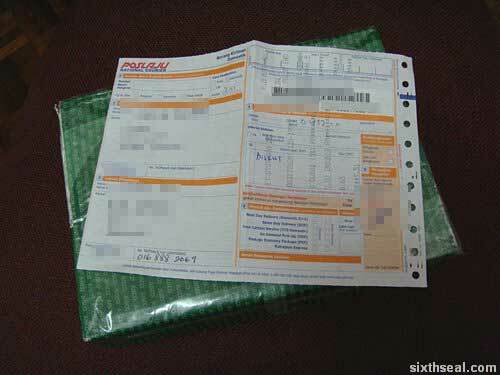 Lady Luck was on my side though and the package containing Oreo from D arrived the very next day! Thus, I re-shot several of the scenes with the real Oreo. It took me two days to complete the Oreo shoot. 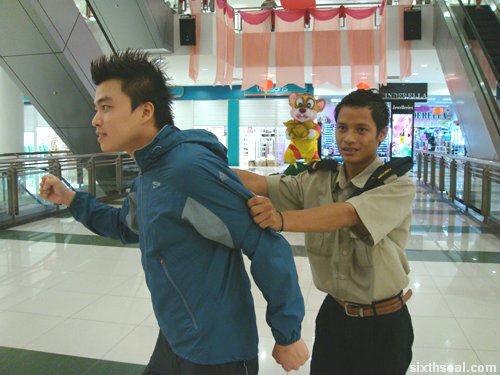 One particular scene that stood out was the shoplifting scene. I did the first one with Cream-O, a local biscuit “inspired” by Oreo, and I had serious reservations about submitting that since the client would obviously not want to see a competitor’s product in the photos. Cream-O looks almost like Oreo due to the blue packaging but I didn’t want to tarnish the advertorial by passing off another product as Oreo. Well, the reason this particular scene was memorable was due to one of my friend’s interaction with the clerk at a local supermarket. 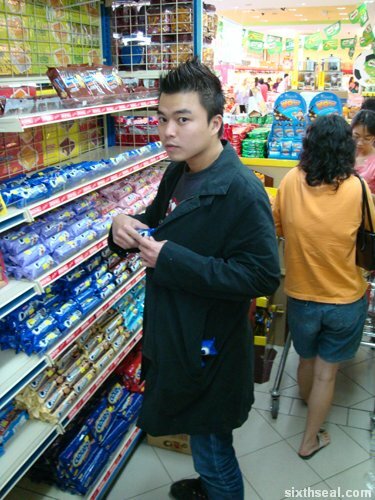 He has a really funny and sarcastic response during the Sibu Oreo Shortage (TM). 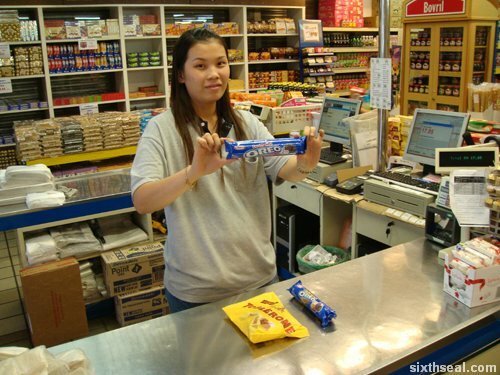 We were at Ta Kiong and they haven’t received their shipment of Oreo as well, but one of the clerks said that there had Oreo biscuits and walked with us down the aisle and pointed to…Julie Stereo. This prompted my wise-cracking friend to launch into a funny tirade against the poor girl. Friend: Stereo? We said OREO not STEREO. Friend: That’s not Oreo! How can you compare Oreo to Stereo? Do you compare a Mercedes to a Kancil? 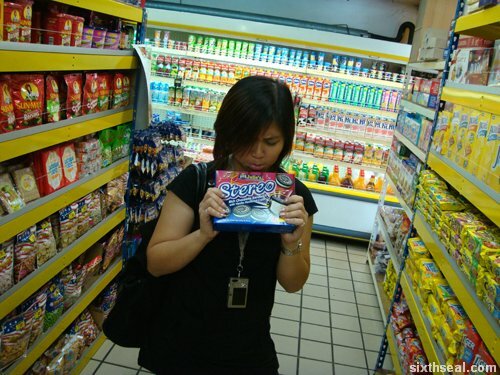 We wanted the original Nabisco Kraft Oreo. Anyway, we didn’t even know if the clerk understood English which was a bit of a mistake on our part. I walked in on Tuesday again to get some chocolates and the very same clerk called out to me and told me that my Oreo has arrived. She then proceeded to talk to a fellow clerk across the counter about getting “suan” (Hokkien for sarcastically teased) by my friend the other day. Reason: Product placement overkill. 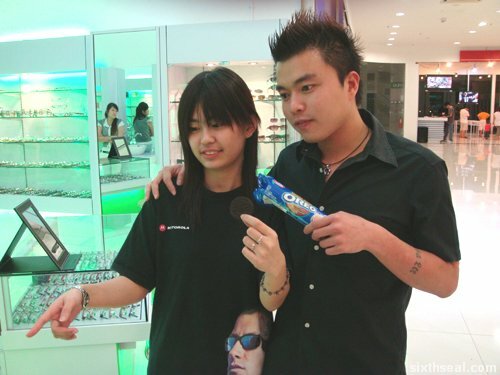 The pose with the Oreo is too fake. Reason: The expression on my face wasn’t right. I didn’t look shocked enough – in fact, I look a little bit too aggressive. Reason: Same as above. 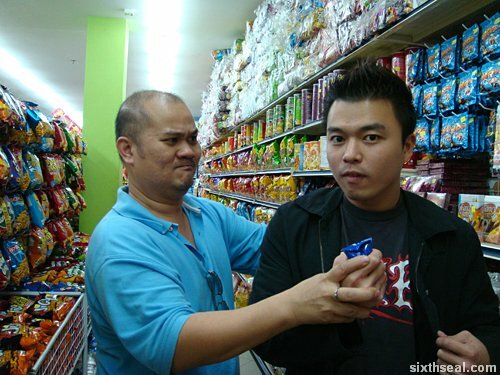 I look more irritated than shocked at being apprehended by a security guard for shoplifting. I needed the comical horror expression at being caught in the act. The funniest thing about this advertorial is that most of the shots were done using a single Oreo pack. 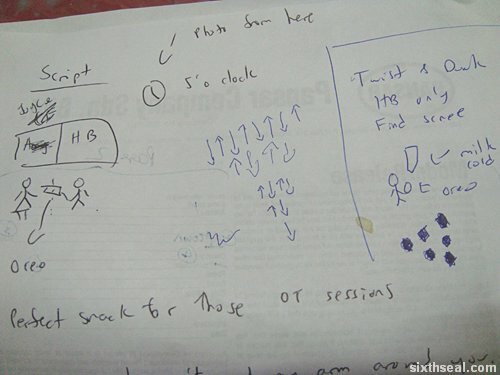 I had to conserve my resources and had planned out which scenes needed the pack to be open and which ones didn’t. I was so stingy with the two packs of Oreo that consumption was strictly controlled even during the scenes except when absolutely necessary. Heh!